USES: The Guajillo Chili Pepper, pronounced wah-hee-o, is the 2nd most common chili in Mexico after the Ancho. The powder is made by grinding the whole pod. It has a strong pine, slightly fruity flavor with berry undertones. A little powder goes a long way. It is a medium heat pepper with a lot of flavor. USES: Aji Panca Chili Pepper is a reddish-brown chili that has a mild and fruity flavor It measures approximately 500 Scoville Heat Units or between 1-2 on a heat scale of 10. It is a perfect addition to any authentic Mexican dish. This chili pepper is common in the American Southwest. De Arbol means "tree like" in Spanish. The Arbol chili pepper is small, narrow and bright red in color. It has a searing heat with acidic, smokey and grassy flavors. It has a 7.5 heat range on a heat scale of 10. It is comparable to Cayenne Pepper. It will add great heat to salsas, chili and stews. Add heat and flavor to your favorite Mexican dish. USES: : Anaheim Chili (Capsicum Annuum) powder has a thin flesh and has tones of black cherry with an earthy flavor. It scores between 2-4 on a heat scale of.10. They are mildly hot and often used in Mexican & Southwest red sauces and sprinkled on fish & chicken before cooking. USES: Aji Amarillo chili pepper is also known as Aji escabeche. It is the most common chili in Peru. It is sometimes known as a Peruvian pepper or Yellow Chili. It has a distinctive heat and bold flavor. Use it to add heat to any dish or for making hot sauce. It is great with chicken and vegetables. It is a bold South American pepper. It is mild to medium heat ranging from 3,000-10,000 on the Scoville scale. Chipotle Peppers are simply smoked jalapeno peppers. They originate from central and southern Mexico. 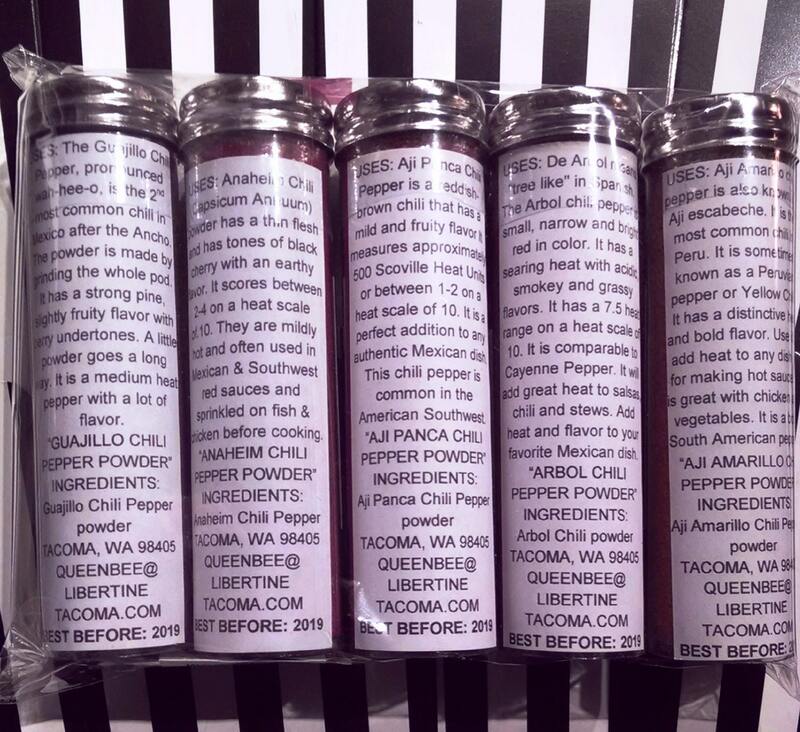 Use it to add a delicious smoked pepper flavor to chili, sauces, vegetables, rice, quinoa and guacamole. It can be blended with other herbs and spices to create a dry rub for meat. It will add a deliciously authentic Mexican flavor to any dish with a little smokey kick of heat. and spicy kick to any food. It has a 10 out of 10 rating for heat on the Scoville Scale. It makes a great addition to homemade chili, hot sauce, Bloody Mary cocktails and chicken wings. Be careful to keep away from eyes and do not inhale as it is very hot. USES: The Serrano chili pepper is native to the Puebla and Hidalgo regions of Mexico. It is a medium heat pepper hotter than a Jalapeno measuring between 10,000 & 25,000 on the Scoville Scale. Use it to add heat and flavor to beef, chicken, rice, salsa and sauces. The Serrano chili pepper is native to the Puebla and Hidalgo regions of Mexico. It is a medium heat pepper hotter than a Jalapeno measuring between 10,000 & 25,000 on the Scoville Scale. Use it to add heat and flavor to beef, chicken, rice, salsa, Pico de Gallo & sauces. The green chili is milder. USES: The Aleppo Chili Pepper is native to the Aleppo region of Northern Syria and Turkey. It is a chili pepper with moderate heat, sharp tasting with a bit of sweetness. It will add an authentic Mediterranean flavor without overpowering a dish. Great on red meat such as lamb and beef as well as chicken. It is also great in soups. Each Vial is 1.69oz/50ml/3.38 tablespoons and has a nickel screw cap that makes it possible to create a magnetic spice rack. Use a magnetic strip under your cabinets and voila. A magnetic knife storage strip that I found at Ikea worked perfectly. 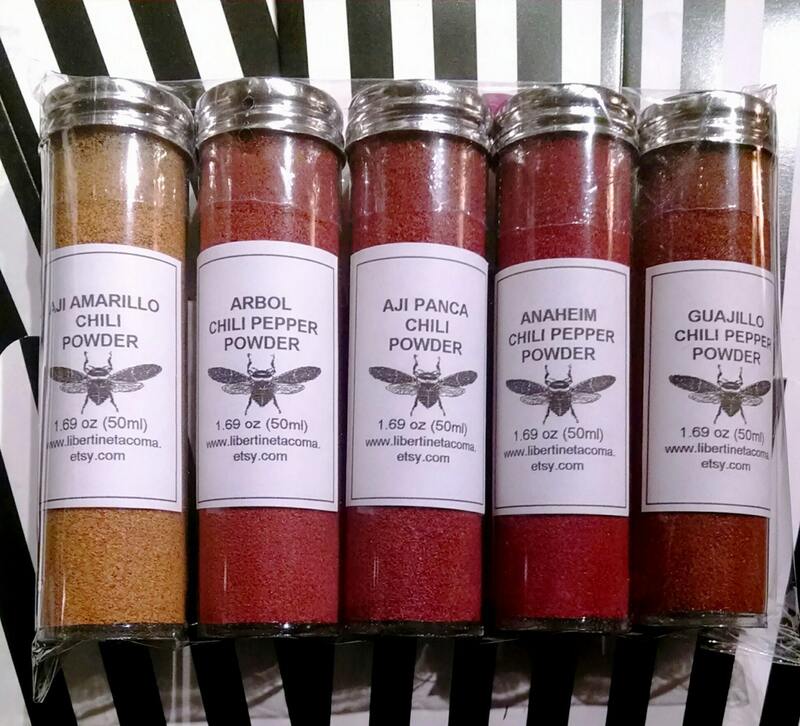 This is fun set for a the spice lover and makes a great gift.